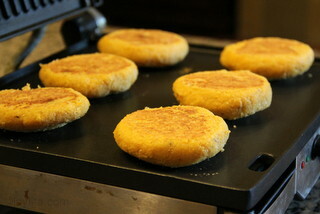 Llapingachos are stuffed patties cooked on a hot griddle, they are typically made with potatoes and stuffed with cheese; however, they can also be made with other ingredients. 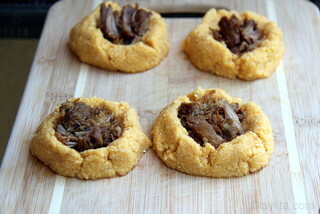 These llapingachos de mote are the result of having a good amount of leftovers after making fritada de chancho, a type of braised pork dish very similar to Mexican pork carnitas. 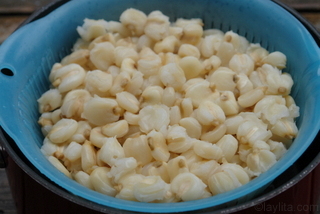 Fritada is served with a variety of side dishes, one of which is mote or hominy corn. I love having leftovers, but I also like experimenting and turning leftovers into something different than the original dish. It’s a good way to test new recipe ideas and it also makes leftovers more appealing to my kids – which helps minimize the “why we’re having the same thing as yesterday” comments. One of my favorite things about eating fritada is when you get a bite of the pork combined with some hominy, pickled red onions and hot sauce. 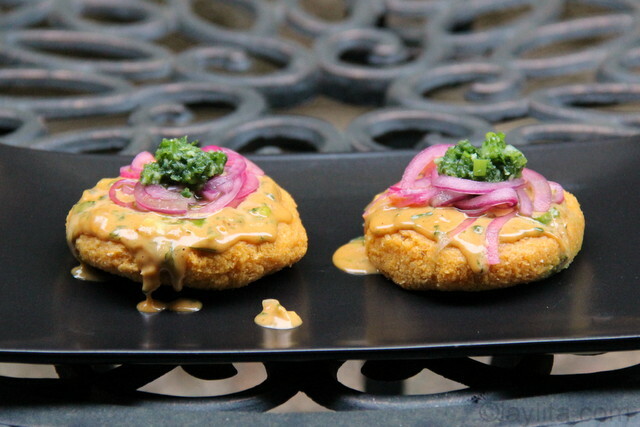 These hominy patties recreate that taste, but also add a little extra yumminess with the creamy peanut sauce drizzled on top. 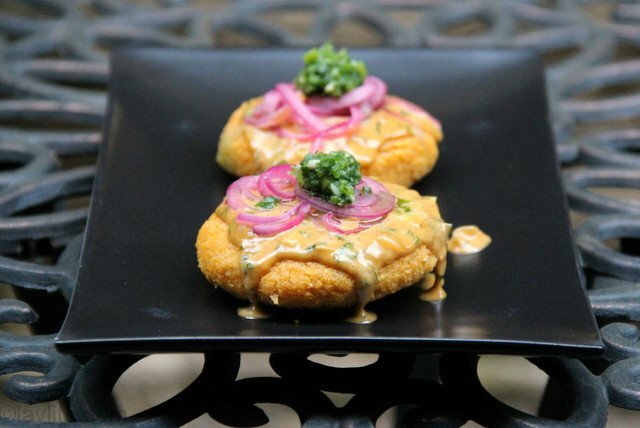 Llapingachos de mote are hominy patties stuffed with pork or cheese, cooked on a hot griddle, and served garnish with peanut sauce, pickled red onions and aji criollo hot sauce. 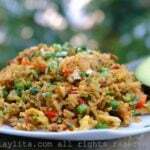 A great way to use pork fritada or pork carnitas leftovers. 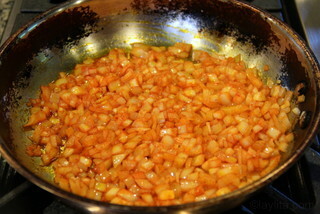 Prepare a refrito or flavor base by heating the oil over medium heat, add the diced onions and achiote powder. Cook until the onions are soft and translucent, about 5-8 minutes. 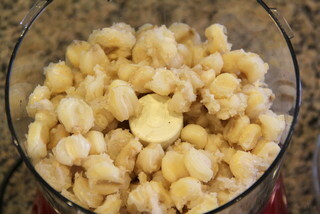 Place the hominy corn in a food processor and pulse until you have coarse dough. 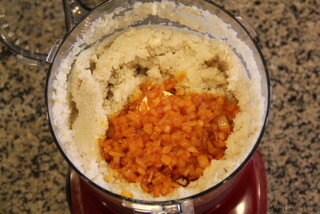 Add the onion refrito to the hominy dough, pulse until blended. 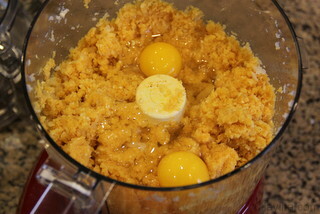 Add the eggs the dough, then stir in the corn meal. The dough should be slightly coarse and mealy but with a consistency that is thick enough to mold a ball of dough and have it keep its shape. Let the dough rest for 30 minutes in the refrigerator. 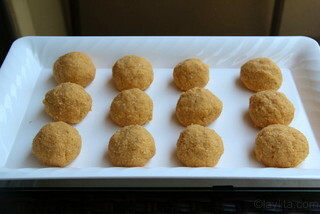 Form the dough into small balls, make a hole in the middle of each ball. 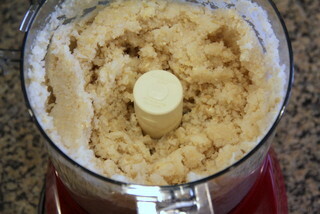 This will need to be done gently as this dough is more fragile than the traditional potato dough. 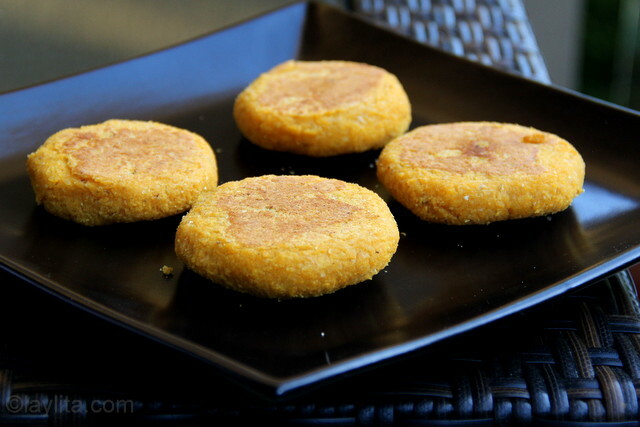 Fill each hole with the fritada meat or the cheese and close it while shaping it into a thick pattie. Let the patties rest in the fridge for at least 30 minutes. 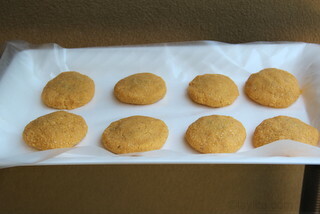 Cook the hominy patties on a hot grilled until browned on each side, the time will vary depending on your grilled. Mine took about 8-10 minutes per side. Be very careful, when turning them the first time as they are very delicate. 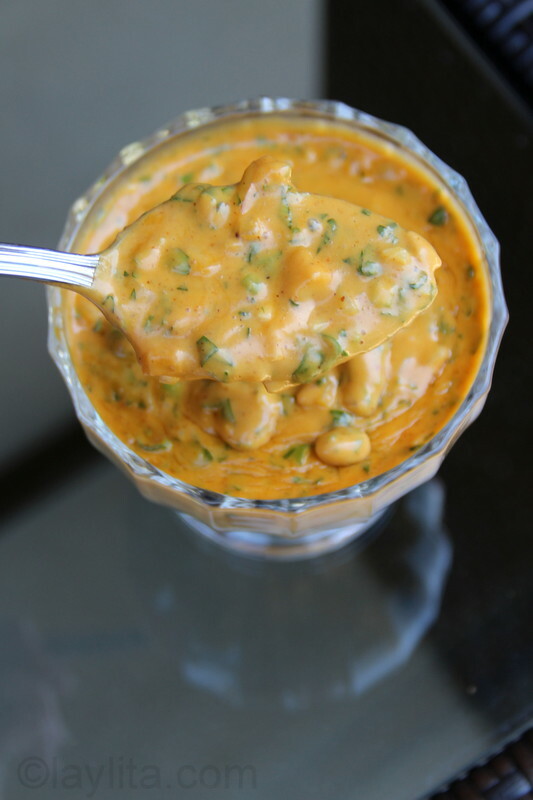 Serve garnished with peanut sauce, pickled red onions, and aji criollo hot sauce. To serve them traditional style or as a main course add a fried egg and some avocado slices. For garnishes, peanut sauce, pickled red onions, aji criollo and avocado slices. 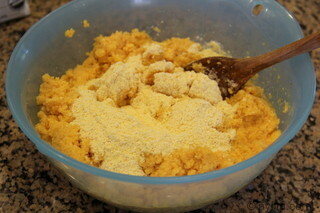 Making llapingachos with hominy turned out to be less straightforward than I originally thought. I planned to make them exactly the way I make potato llapingachos, however the hominy needed to be ground in the food processor instead of mashed like the potatoes. After grinding it and mixing it with the refrito or onion base, I realized that the hominy corn doesn’t have the same starchiness that the potatoes do and it would need some glue. I added a couple of eggs to the hominy dough, but it was still a somewhat soggy. 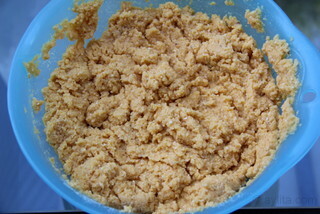 Similar to when making humitas or fresh corn steamed cakes, I added some corn meal to the dough, which helped improved the consistency of the dough. 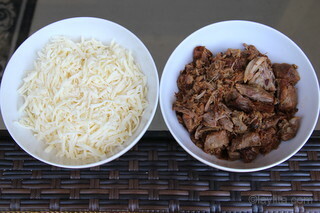 I made half of my llapingachos stuffed with shredded pork fritada and the other half stuffed with cheese. 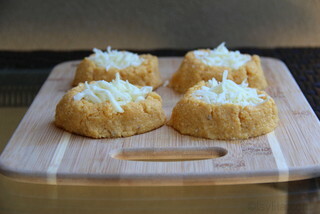 These mote llapingachos turned out so good that I will probably make even when I don’t have fritada leftovers, the cheese one are great and you can use any kind of leftover meat for the filling – I’m thinking next time I will try them with leftover roasted chicken or leftover roasted pork/beef. 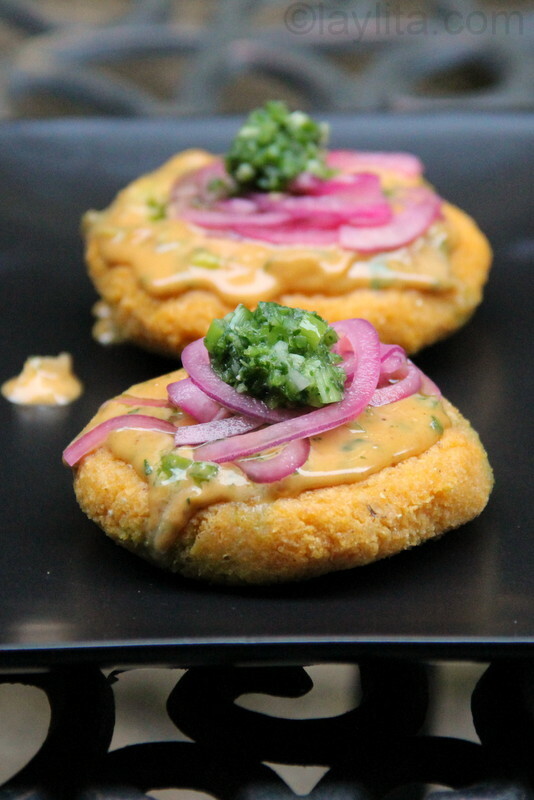 These hominy patties were served garnished with a must-have savory peanut sauce on top, onion curtido or lime pickled red onions, and a spicy aji criollo hot sauce. Traditional potato llapingachos are also served with a fried egg and some chorizo, but in this case I kept these more as an appetizer. If you want to serve it as a main course, then I highly recommend adding the fried egg. The chorizo might be too much if they are stuffed with pork, but perfect if they are stuffed with cheese. 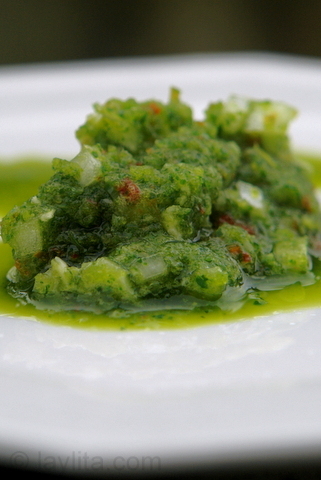 Avocado slices are also a great side to these llapingachos – or to any other dish (in my opinion). I’m a Southerner, and would you believe, with some tweeking, this recipe is amazing with leftover grits. 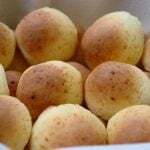 Laylita thank you so much for this recipe, it brought back so many memories of growing up in Ecuador with my mom and grandparents, i also love the site, because i can see the traditional dishes i grew up with which my mom knows by memory and doesn’t have recipes for. This is one of those special recipes I probably won’t get to taste unless I retire or find an Ecuadorian wife. If someone knows of an Ecuadorian who cooks even a little, I’d appreciate not waiting to retire to try these delicious foods and we can start our family and cooking all these good foods. Gracias por la inspiración! Love the recipe! Love the photos!